CRIBWARE is a comprehensive inventory management system that enables you to control tooling costs and usage. CRIBWARE sets itself apart from other tool management systems because it offers complete planning, inventory control, purchasing and usage management in a comfortable user interface. CRIBWARE provides complete item management in a scalable multi-user software package. From a few hundred to thousands of items, CRIBWARE will provide flexible tracking, item identification, comprehensive searches, and advanced reporting to meet your tool management needs. easy to upgrade to more powerful systems. Your tool status information is always current since the CRIBWARE system operates in real-time using the latest database techniques. Searching for tools and substitutes is fast and easy. Critical tooling resources can be traced to their point of use. 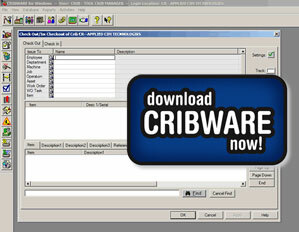 CRIBWARE puts you in control of your tooling inventory and processes. provides extensive online help and documentation. With CRIBWARE you know what items you have and what you need. Items are classified as perishable or durable. CRIBWARE provides standardized part numbering and references for purchasing and manufacturing personnel. Records of usage and consumption allow you to allocate job costs. You can also review scrap and rework costs for each item. Total accountability for all your items results in inventory reductions. Advanced Reports display your items, their storage location and status. Automatic electronic purchasing allows for quick order creation. Reorder points trigger the need to replenish. Usage and purchase history assist purchasing decisions. Multiple descriptions provide the ability to cross reference customer numbers to vendor/manufacturer part numbers. You can select a preferred vendor for your items. EDI purchasing provides greater speed, accuracy and reduced data entry. Integrated receiving specifies stocking location and accounts for item costs. You can view reports on open orders, vendor commitments, order timing and past due items. Real-time status provides current quantities by location, on-hand, checked out, on order, in rework and reserved. CRIBWARE tracks usage by employees, departments, machines, jobs and/or operations, work orders, tasks and/or assets plus two user definable tracking parameters. These tracking parameters may be modified to meet your own unique requirements. Inventory is maintained in individual cells, in cabinets within cribs and between multiple locations. CRIBWARE monitors gage calibration, rework and scrap. It also provides extensive reports for location, obsolete, overdue, calibration, receiving, rework and scrap status. Management involvement in routine processes, expediting and tool and supply searches eliminated. The ultimate solution in vending automation. Flexible square bins for better product utilization. Tambour door opens 2 inches to 60 inches for maximum product dispensing. ©2017 Applied CIM Technologies, Inc. All rights reserved.